“Can we have some mice!?!?!" I’m sure this is a conversation most parents have at some point with their kids. Despite having two cats (Chester and William) and four fish (we had eight at one point. Tim is now buried in the garden, Stripy took her own life, and another two have disintegrated) our daughters, especially our eldest, wanted a dog. This, for many good reasons, wasn’t possible. 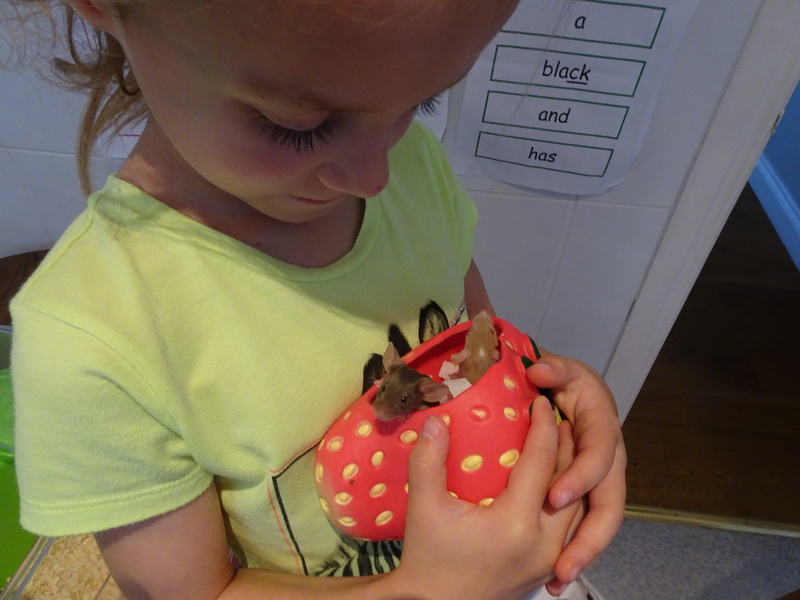 So, one day after a visit to the farm where you can hold various small pets, the mouse request was made. This seemed like a good compromise. They don’t take much looking after and they might stop the girls asking for a dog. I thanked her for her eloquent musings and left. Whether or not this is the reason they aren’t sold in pet shops I can’t say, but, after a bit of research, I discovered that male mice apparently do have a strong odour, so females it had to be. With no mice available on the high street, I had to turn to the internet for help. I found a mouse breeder who lived forty minutes away and had a litter that was ready to be sold. I asked for a picture of some females so the girls could pick one each. They were very particular about what they wanted; one had to be brown and the other ginger, luckily there was one of each. I arrived at the breeder’s house with a little trepidation. He was a complete stranger after all and I didn’t fancy spending the rest of my days ‘putting stuff in a basket’. As a precaution, I’d left my wife instructions on what to do if I didn’t return. I went in and he brought out a large plastic container which had around fifteen female mice in it. And there, huddled together, were the two mice my daughters had selected… it was Mike & Brownie! Why Mike & Brownie you ask? Well, because one was brown and the other was named by a five-year-old. I asked the breeder about his mice and how many he had, he said “Oh I’ve got about a hundred at the minute. I sell a few females here and there, no one wants the males cos they f*****g stink! I’ve got snakes so I breed them as food. Don’t worry, I don’t feed them live, I gas them it’s more humane”. Five minutes into the journey I glanced over to the passenger seat and there was Mike, sitting on top of the cage! She’d escaped and was just staring at me, nose twitching. Maybe she was trying to thank me for saving her and her sister from a grizzly death?